Style, substance, colorful, bright and expressive describes both the personality and professional eye of founder Nancy Stone Whaley. Some would say Nancy's specialty is weaving colors and surface textures into every one of her designs. Most would agree her greatest strength is elegance with a wonderful twist. 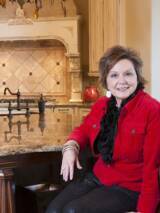 Her innate sense of style has helped craft the interiors of homes and offices for over 25 years. Her broad knowledge of construction means and methods has helped clients create their dream homes from Atlanta to Nashville to Birmingham. A member of the National Kitchen & Bath Association, Nancy's experience ranges from modest homes to big-scale overhaul projects with expertise in kitchen & bath design. Here at Simply Southern Interiors LLC, Nancy's goal is to work closely with her clients to determine and create an environment that is a reflection of their needs - whether it is a single room or an entire home. She believes in open communication as a key to achieving your desired results. And prides herself on meeting budget and scheduling requirements.